When they were toddlers, chickpeas were a super easy go-to snack. As they’ve grown up and their palates have developed, chickpeas have become a healthy part of our family recipes. They can be transformed into a hummus-type dip, added to salads and crisped up in the oven. These little fibre and protein packed legumes take on flavours beautifully, which is why they are perfect in stews and curries. 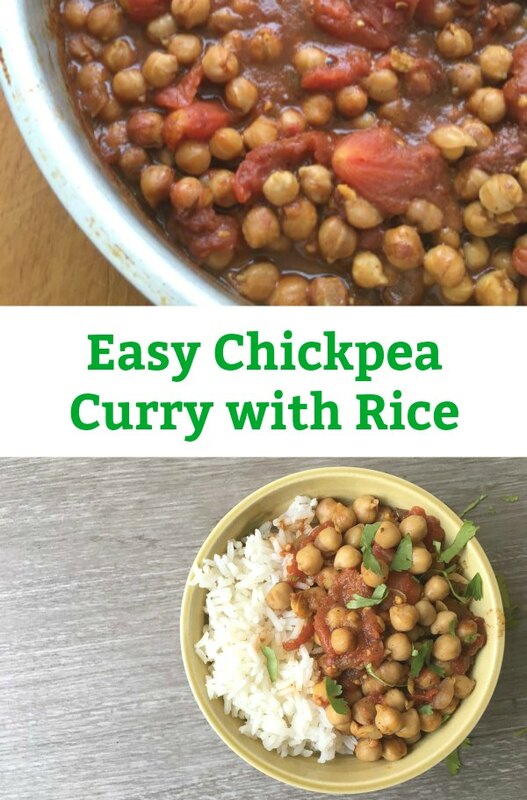 This simple chickpea curry is a super quick healthy vegetarian weeknight meal that can be carried over into lunch boxes. Perfect for busy families. Warm olive oil in a large skillet, over medium heat. Add shallots and garlic – saute until softened. Stir in all spices and warm through, approximately 1 minute. 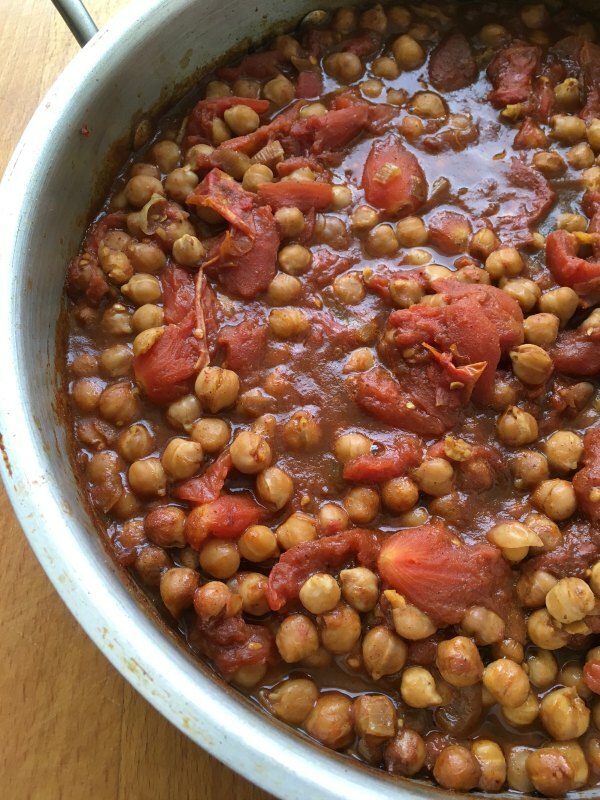 Pour in chickpeas, tomatoes, vegetable stock and tomato paste. Bring to a boil and turn down to a simmer. Simmer for 15 minutes, until sauce thickens and chickpeas are tender to the fork. If you like a spicier sauce, add a tsp of siracha sauce. In the meantime, make the basmati rice according to your package instructions. 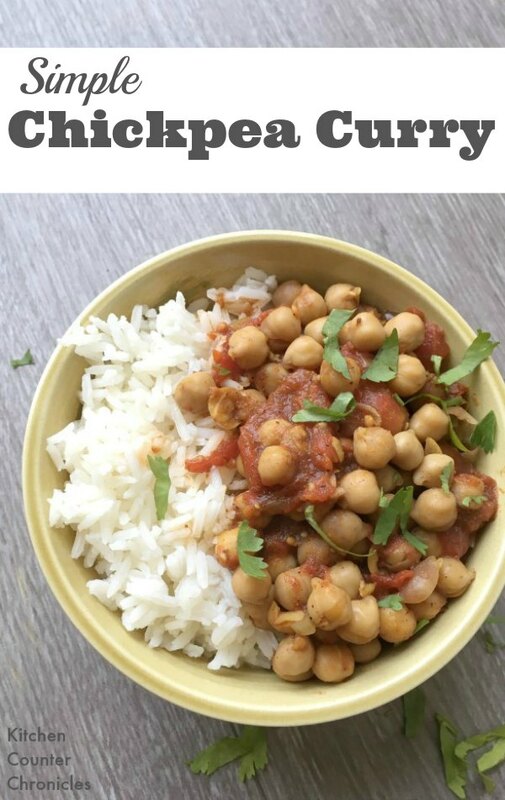 Serve the chickpea curry over a bed of rice and sprinkle with cilantro. Enjoy. In about 30 minutes, you have a warm, comforting dinner that everyone in the family will love. 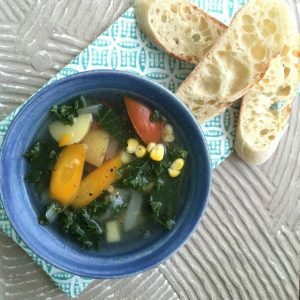 This dish is perfect for families who are looking for simple vegetarian meals. Be sure to check out our collection of meatless recipes for more plant based dinner ideas that your entire family is going to love. 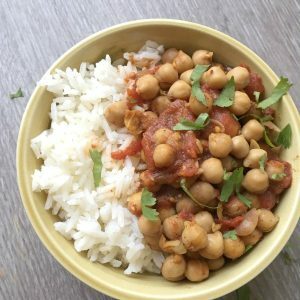 All the warm curry flavours in this healthy, vegetarian chickpea curry family friendly dinner dish. Warm olive oil in a large skillet, over medium heat. Add shallots and garlic - saute until softened. 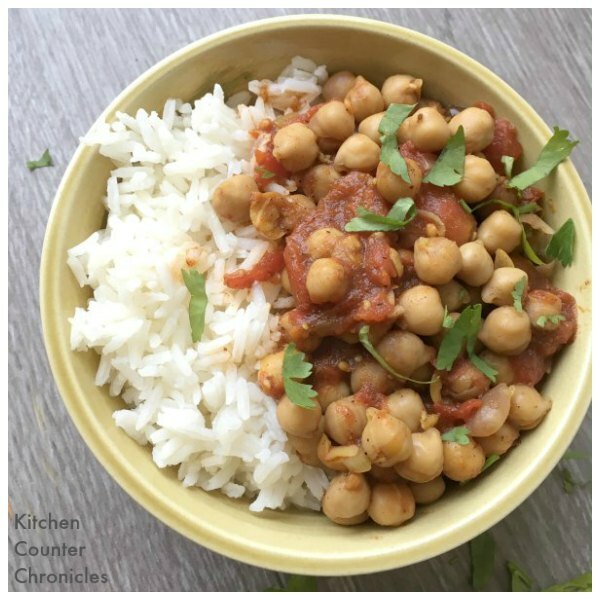 Serve the chickpea curry over a bed of rice and sprinkle with cilantro. Nutrition Info is to be used as a rough guide only. Nutrition Info is based on the products I am using and you may not be using the same products/brands. Thus, the Nutrition Info may vary. 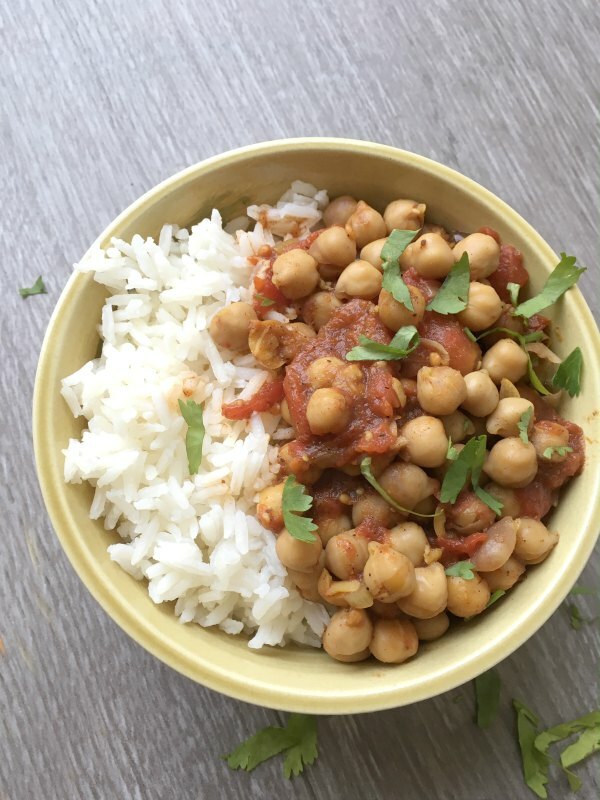 Today’s healthy, simple and delicious chickpea curry recipe is another fun example of a twist on a classic, basic recipe that families can prepare and enjoy at home. We put a vegetarian twist on Jamie Oliver’s lamb and chickpea curry. 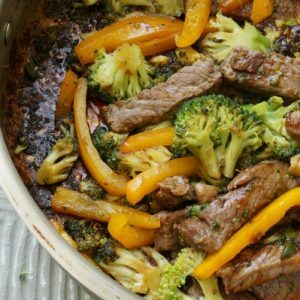 Be sure to check out Jamie Oliver’s 10 Food Revolution recipes and see what twists your family might like to make on his collection of basic family friendly recipes. SUBSCRIBE TO KITCHEN COUNTER CHRONICLES TO HAVE OUR DELICIOUS RECIPES, FUN CRAFTS & ACTIVITIES DELIVERED DIRECTLY TO YOUR INBOX. Kitchen Counter Chronicles is a participant in the Amazon Services LLC Associates Program, an affiliate advertising program designed to provide a means for us to earn fees by linking to Amazon.com and affiliated sites.